I had fun reading the picture book, Infinity and Me, by Kate Hosford today. If you haven't read it, do so! 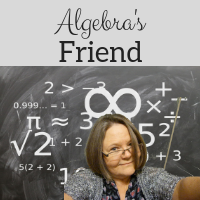 If you teach math, buy it for your classroom. Many of us teach sets of numbers early in the year. We talk about infinity in domain and range. Infinity is one of those topics that makes for a great enrichment project! You can access the Google Doc here ... just copy it to your Google Drive. Complete three activities making a tic-tac-toe from the Choice Board. Use at least three of the following resources. Create a reference page for the resources you use. Hosford, K., & Swiatkowska, G. (2012). Infinity and me. Minneapolis: Carolrhoda Books. Define infinity for a 1st grader. Define it for a 6th grader. Define it for a high schooler. How do your definitions change? Explain the infinity symbol. What is it’s name? How did it originate? What does infinity look like to you? Draw a picture that captures infinity. N. Angier says in her New York Times post, “... there are infinities, multiplicities of the limit-free that come in a vast variety of shapes, sizes, purposes and charms.” What is meant by “different” infinities? Select either the infinite hotel paradox or Zeno’s Paradox. Write a story, poem, or essay about the one your choice. What is a doppelgänger, and why does the existence of an infinite universe suggest yours might exist? Make a list of quantities that you believe are infinite and present that list to a group of classmates. Invite your classmates to debate whether or not the quantities are finite or infinite, and if infinite, which kind of infinity. Mime Tim Chartier uses movement to explore and express the idea of infinity. Watch his youtube video. Then, create your own skit or mime to convey how you see infinity. Is it possible to find the sum of an infinite series? Explain.